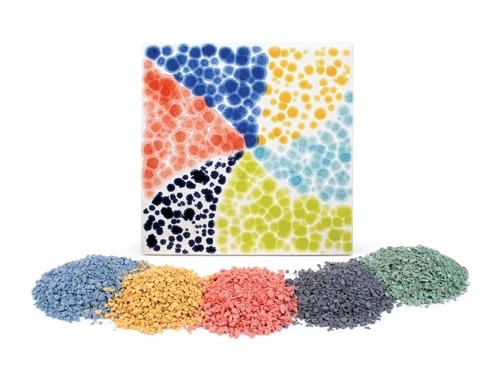 Add Amaco Glaze Crystals to any Amaco glaze to create one-of-a-kind, multi-color effects. Simply place them where desired on the piece while the glaze is still wet. Firing temperature is Cone 05. All colors in the glaze crystals series are LEAD FREE. Cone 05. Through the use of contrasting colors, any AMACO glaze can be turned into a Crystaltex Glaze. One or more colors of crystals can be added to a base glaze for exciting results. Each piece of pottery is one-of-a-kind, never to be duplicated. Apply the crystals by placing them where desired on the piece while the glaze is still wet. When fired, the crystals flow into the base glaze. These crystals are recommended to be used with glazes that mature at Cone 06-05 (1855°-1911°F, 1013°-1044°C), although they can be used at any temperature. They are not recommended for surfaces which come in contact with food or drink. All crystals fire to a gloss finish. Amaco Glaze Crystals come in a four ounce jar. To download a copy of the AP (Non-Toxic) colors MSDS sheet in PDF format, please click here. Amaco® Glaze Crystals come in a four ounce jar.